The Duke, named in honor of football legend Wellington Duke inch Mara, is the official game ball of the NFL. Wilson has been the official game ball of the NFL since 1941. Hand crafted in Ada, Ohio The Duke inch has an exclusive pattern to the NFL using hand picked Wilson Leather and double laces for added texture and control. Every NFL Game Ball sold in stores is inspected by hand and must pass the same specifications as those used on the field every fall. Our team, the Palm Beach Mariners, has utilized this product for two years with excellent results. Each time, we have purchased through walmart.com. Tbook.com crawls the web to find the best prices and availability on zz and related Sporting Goods products like Wilson "The Duke" Official NFL Game Football. For this page, related items include products we find that match the following keywords: "Tennis|Baseball|Hockey|Football|Golf|Basketball|Tennis|Soccer|Bounce House" at our vendor partner Walmart. 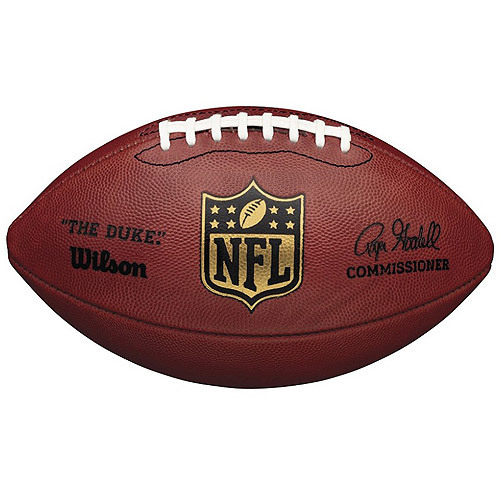 Wilson "The Duke" Official NFL Game Football is one of 8 zz and related products listed in the Sporting Goods section of Tbook.com If you have any questions on this product, please give us a call at 734-971-1210 during the hours of 9am - 5pm EST for assistance. Thank you for shopping at Tbook.com, the Internet Department Store!